Today, senior representatives from Freedom Leisure met with Councillor Mark Buckton, Portfolio Holder for Leisure and Young People Fenland District Council on the start of a new 15-year partnership which will see enhanced leisure facilities for residents. 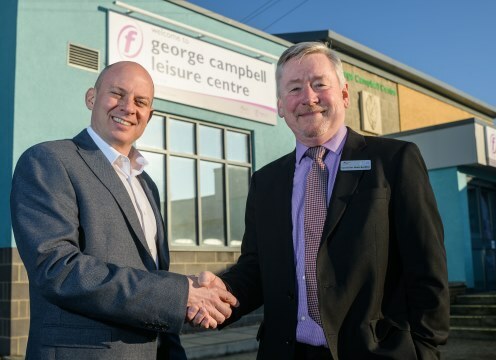 Fenland’s four leisure centres; Chatteris, George Campbell, Hudson and Manor will be managed by the not-for-profit leisure trust in partnership with, and on behalf of, Fenland District Council – giving them a bright future and supporting the people of Fenland to be more active and healthy. Matt Hunt, Freedom Leisure’s Operations Director and Dan Palframan, Freedom Leisure Area manager, were joined by local councillors, along with Freedom Leisure’s mascot, Jim Trainer and staff members proudly showing off their new uniform, at George Campbell Leisure Centre to formally mark day one. This partnership is committed to ensuring that Fenland’s leisure services provided for residents are protected and taken forward; with quality, affordability and accessibility at their core. Of the new contract, Matt Hunt, said: “We are delighted to have been selected by Fenland District Council as their leisure partner to ensure these essential community facilities remain where they belong. This is a long-term partnership with a huge amount of investment which we hope demonstrates our genuine commitment to the district and its public leisure services. With £1.1m of investment due to be made, there are lots of exciting facility developments and improvements in the pipeline including extended and refurbished gym and studio spaces, state-of-the art fitness kit and improved catering offerings, plus the recruitment of an Active Communities Executive and the introduction of many new community-focussed outreach programmes, to support everyone in the district no matter of their age or ability. We are delighted to have been selected by Fenland District Council as their leisure partner to ensure these essential community facilities remain where they belong. This is a long-term partnership with a huge amount of investment which we hope demonstrates our genuine commitment to the district and its public leisure services.